If you’re glamping, camping or even just planning an evening under the stars in the outdoors, for warmth and atmosphere you’re more than likely to want to have an open fire. There are few things more earthly than sitting around a fire with friends and family, and hopefully the more adventurous amongst you will be using an open fire for all your cooking requirements too. Don’t get me wrong, gas and BBQs have a place, but there’s a real sense of accomplishment to be had from using a fire to provide your heating and cooking needs. So, how do you go about building the perfect fire…? Firstly, there’s more than one way of building a fire, and depending on the location and setting these can vary, but this article sets out some pretty fail-safe hints and tips to get you, or your fire, started. As with most things in life, planning is key. Once you’ve got a flame it’s no use then starting to find more fuel for your fire, so the first steps on building a fire should be undertaken before any matches are struck. Once you’ve identified your fire site, ideally down wind of your accommodation (and far enough away to prevent stray sparks causing worry) you can set about preparing. This guide assumes you’re building a fire on the ground, but everything you read here applies to fire pits, wood-burning stoves and even traditional open-fires in buildings. Tinder is typically dry, dead twigs, about the size of a pencil lead, and readily available from the lower branches of trees and bushes. This is what you ignite first to start the fire (we’ll pretend you’re not going to use a firelighter at this point, but it’s okay if you do…) Make sure the tinder is dead wood as green wood shouldn’t be used (for both practical and ecological reasons!) 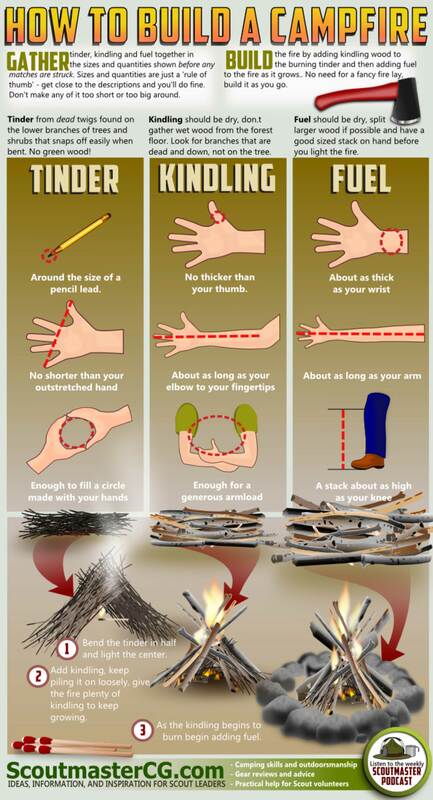 You’ll need enough tinder to fill a circle made with your hands (see the great infographic from Scoutmaster CG right). The main Fuel for your fire is wood that’s certainly dry and made up from larger logs, ideally split into manageable sizes using an axe. Thickness can vary but if it’s about the thickness of your wrist this is ideal. You’ll need a fair bit of this, so aim for a good pile about knee height. Of course you can gather more but if storing in the open you may want to think about keeping off any rain. People talk about ‘seasoned’ logs – this is wood that’s basically dried-out for a season, and you can find this on dead trees if you search around a bit. Most sites that sell logs will be selling seasoned wood but don’t be afraid to check; there’s nothing worse than trying to burn wet logs that aren’t properly dried-out. Get your tinder and bend this over to form a small tent-like structure in the centre of your fire area. When ready, light this using a match or lighter. (You can use a flint striker of course too but this may take a little longer and you’d need very dry, small tinder to catch). Once lit, start to place some of the smaller kindling onto the burning tinder. Be careful not to smother the fire as air flow is your key to a good fire (who remembers the fire triangle composing the three essential elements of any fire – fuel, heat and oxygen…?) As the fire take hold you can add more kindling and start to expand the base of the fire. Once the fire is established you can add the main wood fuel to the fire to create both flames (for light and warmth) and these will burn-down to embers (which are perfect for cooking over). If you’re using your fire for cooking you can try feeding the fuel from one side of the fire so you should end up with a flame-rich side (where the new fuel is being added) and a more burn-down, ember-rich side ideal for cooking pots and foil-wrapped items such as jacket potatoes or our Chocolate Orange Fire Cakes. Once you’re ready to retire it’s a good idea to make sure the fire is safe. ‘Damping-down’ suggests using water but we’d generally not recommend wasting water in this way. Rather, if you’ve managed the fire effectively you shouldn’t have any more flames to contend with; you’ve probably got a good bed of embers contained in your fire area. What’s key here is to ensure that no more fuel could become alight from the embers so remove any wood from the immediate vicinity and make sure nothing can blow or fall into the fire. If you’re fire was good enough (and it doesn’t rain too heavily overnight) you should be able to re-ignite the fire using more tinder in the morning, impressing your fellow glampers with a cup of tea made from water boiled on the same fire from the night before. Of course it goes without saying that when leaving a site you should make sure the fire is completely extinguished. As mentioned above there are multiple methods of successful fire building but this guide and the infographic should stand you in good stead if you are embarking on using an open fire to add to your adventure.